Just in time for the 4th of July, and triple digit heat, we’re gonna cool down after hot rides with some whole-food, high nutrition “ice cream.” There are a whole lotta options this week, so pick your favorites, sit back, relax, and let the healthy fats, antioxidants, and real food nutrients replenish you. Dice pears into ½” cubes. Spread in a single layer on foil lined tray or baking sheet. Pour coconut milk into your blender carafe or into a glass jar or bowl. 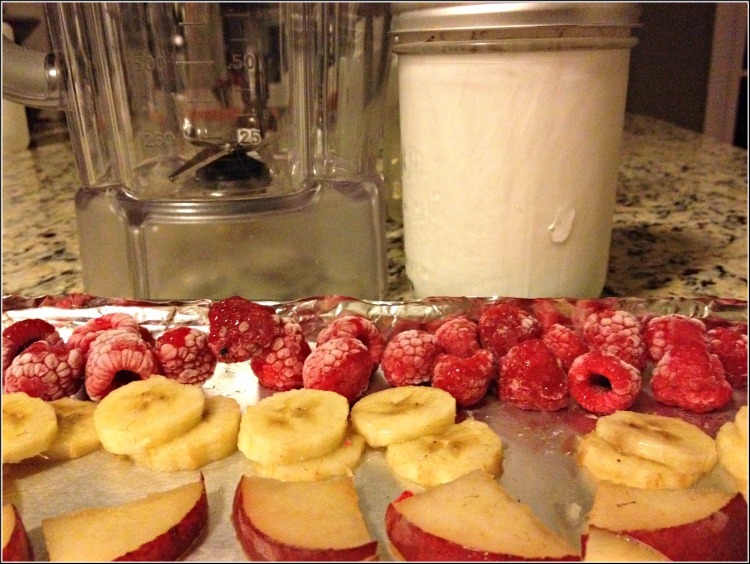 Place both the fruit and the coconut milk (both uncovered) in freezer. Quick-freeze in freezer for about 1 – 1 ½ hours. Place frozen pear cubes in blender with cinnamon. Blend quickly, adding thickened coconut milk, a spoonful at a time. Add a small amount of honey or maple to taste (optional), and finish blending until resembles soft serve custard. Serve immediately. Serves 2. Cherries – Either use fresh, pitted, and freeze, or, use frozen. Omit cinnamon. Berries – Any type. No need to cube, simply freeze and use. Bananas – Slice, freeze, and use in recipe same as pears. Cocoa – Use ¼ cup high-quality cocoa instead of fruit (no need to freeze cocoa). Add 1 tsp real vanilla. Or, mix and match fruits & flavors! Whole body health and energy – Its extremely healthful fats, Medium Chain Triglycerides (MCTs – very easily digested, efficient energy producers that are seldom stored as fat) and lauric acid, promote overall energy and health. They provide anti-microbial benefits, increased insulin sensitivity in cells (which promotes health and discourages fat storage), increased fat burn, and improved cardiovascular markers (improved cholesterol). Reduced risk of high blood pressure: Copper, potassium, and vitamin C work to reduce blood pressure and keep blood vessels elastic (which further reduces risk of high blood pressure). Strong bones: It’s not the calcium, but the phosphorus from coconut milk that best promotes bone health. Phosphorus is an essential nutrient that the body needs for strengthening bones – a requirement to prevent bone loss alongside calcium. Oxygenated Muscles: If you’re low on iron, you’re likely low on energy; and, this spells trouble for a cyclist. While it may not be quite as highly absorbed as heme-iron (from red meat), the iron found in coconut milk can contribute to healthy iron levels and better energy on the bike. Reduction in muscle cramps and soreness: Coconut milk is rich in electrolytes including phosphorus and magnesium. An imbalance of (too little) magnesium and (too much) calcium can cause excess muscle cramping and soreness from overactive nerve cells. Usually, we’re able to get in enough calcium, but often lack magnesium. Coconut milk offers a great source for sore, cramping cyclists! Reduced Joint Inflammation: Selenium, as found in coconut milk, is an important mineral and antioxidant. It fights free radicals that build up in the body, thereby reducing oxidative stress, inflammation and arthritis. After intense exercise, your muscles may recovery better and rebuild during sleep at night if you include protein just prior to going to bed. So, instead of wasting this valuable opportunity with any ol’ dessert, use our high-antioxidant and protein coconut milk ice-cream – make sure to include the scoop of protein powder! If you’re over heated, over tired, or just over low-nutrient junk desserts, upgrade to our Coconut Milk Ice-Creams. They’ll keep you cool and aide in recovery, or just help you enjoy the summer with an ice-cold healthful treat. I see that you recommend using canned coconut milk. We typically use coconut milk that comes in the tetrapak type containers. Is that okay to use or should we be switching to canned? What is the problem with non canned? Hi Eric, Thanks for your comment! Tetrapaked coconut milk is fine as long as it’s full-fat coconut milk. I’m just trying to distiguish between real coconut milk and the ones that come in the dairy section refrigerated – while these are fine for some use, they are not full-fat and are diluted (full-fat usually has 120-150 calories per 1/3 cup, the refrigerated milk substitutes have 80-120 calories per cup). Thanks also for this point as tetrapaks are generally bpa free. I don’t think it will work, but you can try:). If you buy cans, look for the ones listed above in the ingredients, or look for the tetrapaks Or, if you have unsweetened coconut flakes, you can make your own coconut milk (not hard) and then make your own coconut milk ice cream. Now that’s homemade for sure! We use coconut milk quite often and I have thought about making it into icecream but haven’t looked around for a recipe. Thank you for this reminder and information and will most definitely make this very soon. Thanks for your comment! I hope you enjoy the ice cream…I sure enjoyed all the testing of these recipes!